'Mad Men' Season 6: Will Megan Draper Die As Conspiracy Theorists Believe? Mad Men&apos;s sixth season has been all about portents. The bloom has come off the marriage of Don Draper and the younger, mealy-mouthed Megan, and each episode has been keen to broadcast the message in that its dashing lead is in an existential crisis. What better way to formalize it than with a brutal, grisly murder that would turn the lives of Sterling Cooper & Partners upside down? This is the thinking of online conspiracy theorists, who originated, on Reddit, the idea that Megan Draper is not long for the Mad Men universe. It began, as all good conspiracy theories, do, with a t-shirt. Megan confronted Don in "The Better Half," wearing a white t-shirt with a red star emblazoned on it — identical to one worn by Sharon Tate in a 1967 Esquire photo-shoot, two years before she was killed by the Manson Family. Is Megan being primed for a similar fate? Mad Men&apos;s costume designer Janie Bryant then tweeted that it was "no coincidence" that this shirt was used. And like Megan, Sharon Tate was a Hollywood actress unhappy with her absentee husband (hers being the film director Roman Polanski — who directed Rosemary&apos;s Baby, a book Don&apos;s daughter Sally was seen reading in bed in another episode). Tate was pregnant at the time of her death, and Megan revealed earlier in the series the story of her miscarriage. Fuel was fed to the fire by fashion bloggers Tom & Lorenzo, who analyze the clothing of characters each week. Parallels were drawn between Megan&apos;s red star and the stab wound of unfortunate journalist Abe, who was accidentally bayoneted by Peggy Olson (and then proceeded to dump her in the ambulance). There&apos;s no doubt that the team behind Mad Men are taking the show into a darker direction — but will it go as far as murder? Unlike a lot of television, Mad Men doesn&apos;t exist in a vacuum. The tumultuous events of the time are reflected in the characters&apos; lives. There has been, in this season alone, the assassination of Martin Luther King Jr featured, as well as that of RFK. The 1968 Democratic National Convention and the ensuing police riots were featured in this episode - and the tensions around each character are palpable enough to be cut through with knives. New York is seen anew by everyone from Peggy to Megan, who realise that the city is no longer as safe as it once was. There was Abe&apos;s mugging and stabbing at the hands of Peggy, the Draper house invasion by "Grandma Ida" and in the latest episode, police sirens were a constant soundtrack. There&apos;s also 1969 coming up: a year remembered most for representing the death of Free Love through the Tate-LaBianca murders and the horror that was Altamont. As music critic Robert Christgau wrote: "Writers focus on Altamont not because it brought on the end of an era but because it provided such a complex metaphor for the way an era ended." And knowing Mad Men creator Matthew Weiner&apos;s love of metaphor and symbolism, 1969 may very well erupt in violence for Don Draper, whose mental state this season has been shaky. His relationship with Megan is in a holding pattern of mutual dissatisfaction, not properly assuaged by his affair with Sylvia, his next-door neighbour. His hallucinations and near-drowning in "A Tale of Two Cities" did not augur well for Don, but threw up confirmation that the times they are a-changin&apos; — particularly regarding his wife. He was reading Dante&apos;s Inferno in the season 6 opener, and the hand-drawn promotional poster for the show leaves much open to interpretation — why are there two Don Drapers, and what could the police presence mean? Ominous as an adjective is an understatement. Jessica Paré, who plays Megan Draper, addressed the conspiracy theories in a recent interview, seemingly putting them to bed. "There was a reference photo in the costume shop that was that shot with Sharon Tate ... Women didn&apos;t really wear a lot of t-shirts at the time, so we were trying to find a t-shirt, where this woman was on her balcony, by herself ... looking vulnerable and casual." So the great t-shirt theory may just be that: a theory. Mad Men conspiracy theories have been foiled before, as in the case of Pete Campbell&apos;s anticipated death last season. As mentally scrambled as the normally oily and smug Pete was then, it was SCDP partner Lane Pryce who fulfilled the prophecies and committed suicide. Vis-à-vis Megan though, Dustin Rowles at Uproxx is "sipping the Sharon Tate Kool-Aid," formulating a theory that, The Sixth Sense-style, Megan is already dead. Don Draper does have a habit of hallucinations and flashbacks (Anna Draper, the complicated mother-whore figure that was Aimee, and so on), but this may be a stretch too far. Whether Megan is already dead, or soon to die, it is still fun to speculate. There are also murmurings around the identity of accounts man Bob Benson, who has sprung forth seemingly out of nowhere, sporting tiny shorts and the ever-present two coffees. He may just be a mini-Don, eager and willing to please in order to get ahead. Or he may be a spy, Peggy&apos;s son time-travelling from the future, an undercover journalist, or just a nice guy undercutting the show&apos;s cynicism. Matthew Weiner is giving nothing away: "He&apos;s definitely a liar. I hope that you caught that. And I hope that you caught that he — you don&apos;t think he seems like an ambitious person jockeying for a job?" 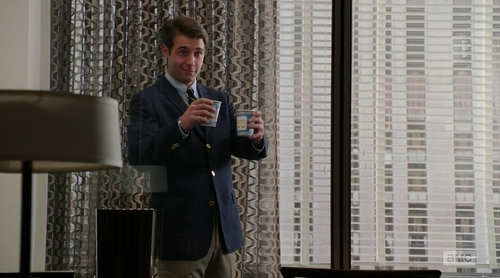 There&apos;s no denying that even as it reaches its twilight seasons, Mad Men is a clever show. While The Week sniffed: "After 10 episodes (and with just two more to go), Mad Men&apos;s sixth season has been a disappointment, leading viewers to start looking for clues that there&apos;s something more interesting going on under its water-treading surface," an increase in viewer engagement is a good sign. Why should conspiracy theories be left to cliff-hanger heavy programs like Lost or Twin Peaks? Everyone, at one one point or another, has wanted to be the dapper Don Draper, coveted the wardrobes of Betty and Joan, or admired Peggy&apos;s non-linear career advancement. Sometimes Mad Men acts as a mirror to our desires (Jon Hamm, you&apos;re still so beautiful), and lately, it has turned the looking-glass to a dangerous, confusing time. Season six&apos;s episodes have existed in a fug, sometimes drug-addled but mostly troubling. Our time may not be characterised by horrors such as the Tate-LaBianca murders or 1968&apos;s endless violent marches. There is a Democrat safely installed in the White House; not Richard Nixon. The Vietnam War is but a memory, many of its veterans now dying off and out of our consciousness. But there is still a sense of unpredictability and woe that is universal — and whatever happens next Sunday, and eventually into season seven, Mad Men evokes it in a way that is memorable and transports you between the times.